Since this post is about creatures fairly high up on the food chain of the Kaas plateau, I could start with the top predator I saw: the funnel-weaving spider (family Agelindae) you see in the featured photo. This one had laid down a huge sheet of a web covering several Topli Karvi bushes, and was waiting for food to fall out of the sky. When an insect lands on the web, it usually runs very fast to it and engulfs it in silk. Now, with rain drops falling intermittently on the web, I’m sure this guy had his work cut out, trying to distinguish rain from food. Other insectivores on the plateau are plants: sundews and bladderworts. I’ve written about them elsewhere. This snail is about the largest animal I took a photo of on the plateau. There are birds; the Crested Lark (Galerida crestata) had put in a hazy appearance in the morning mist. After it started raining we saw no birds. 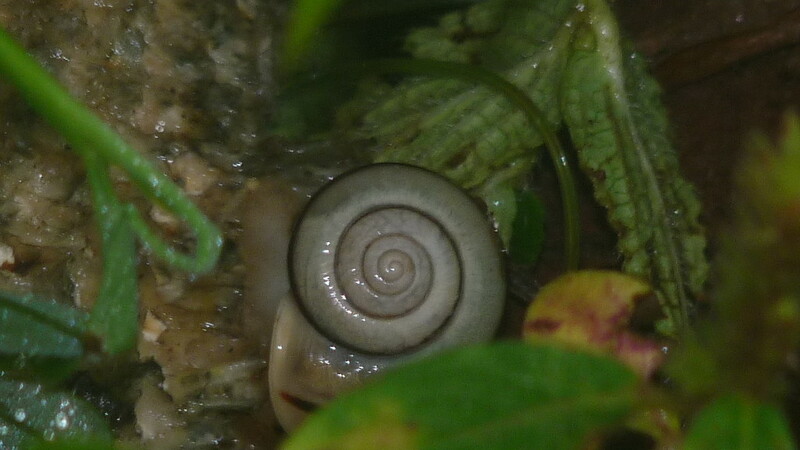 The rain does not stop a snail, as it munches the roots of Topli Karvi bushes. This was on its way from one bush to another, when I saw it. It didn’t seem to move as I took the photo, meaning it would take an age and half to get to the next busg. The western ghats harbour a large variety of land snails; I’m not sure which species this is. Any expert comments? 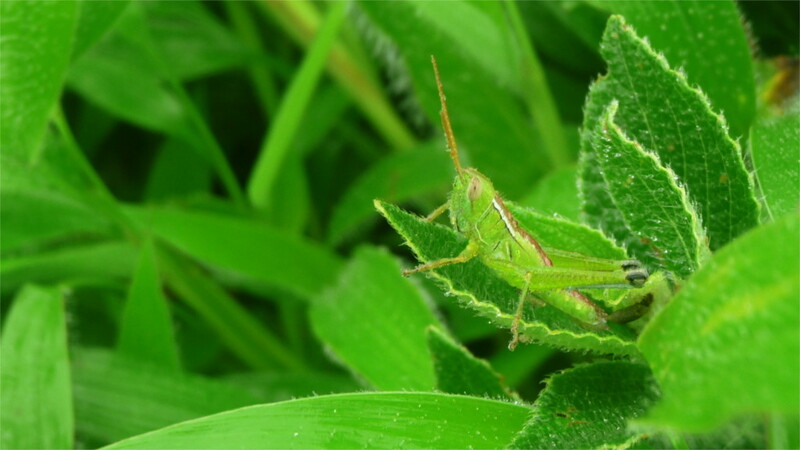 One of the more common animals which inhabit these parts are grasshoppers. Judging by where it was sitting, this one probably feeds on the leaves of Topli Karvi. It has a silly startled look, as it turns its head slightly to take a look at the relatively large camera lens looking at it. I couldn’t get a shot of the three eyes it has on top of its head. Again, I have no idea what species this is, and have to depend on the kindness of an expert to provide the answer. A very strange animal was this leaf piercer. It stood on this leaf for a long while as people tried to photograph it. The early photos show a little spot of sap on its long snout. 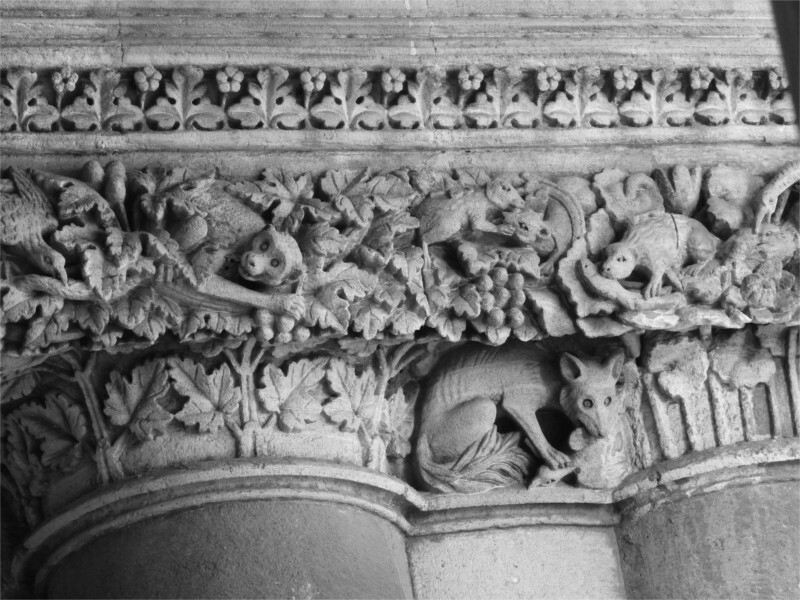 By the time the last photos had been taken the sap had disappeared: it had done its version of licking its chops. I have no further idea about the classification of this beautiful and strange beast. Interestingly, none of these animals are pollinators. 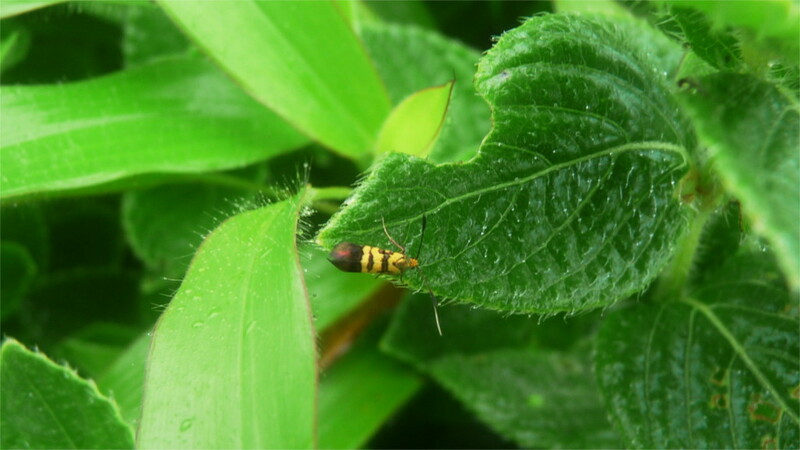 This tiny moth which flew on to a Topli Karvi leaf while I watched is also unlikely to be a pollinator. It is quite likely to be another herbivore. Interestingly, the leaf it is sitting on already has been attacked. Usually true bugs (order Hemipteran) attack plants in this way. Unfortunately I didn’t see any. 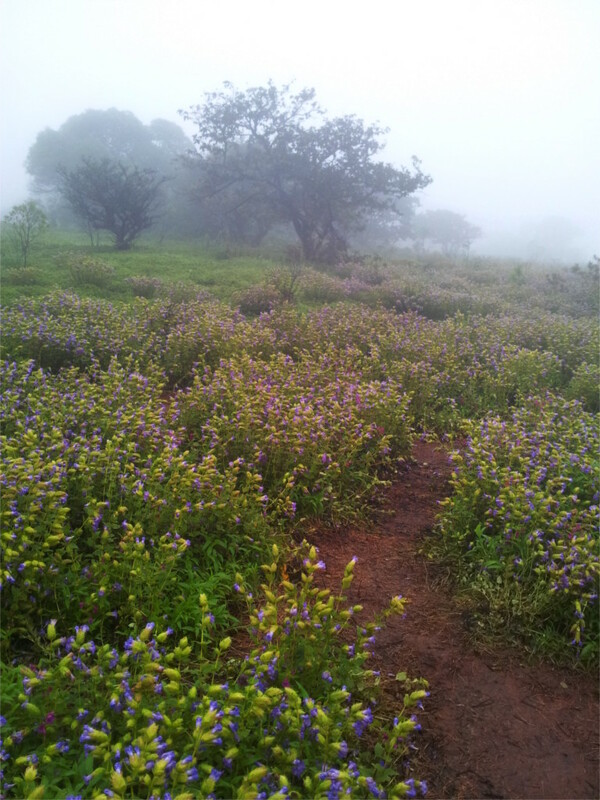 I didn’t see a single butterfly in my few hours in the Kaas plateau. It was raining, and butterflies don’t like to get their wings wet. More likely, the butterflies had not pupated yet. 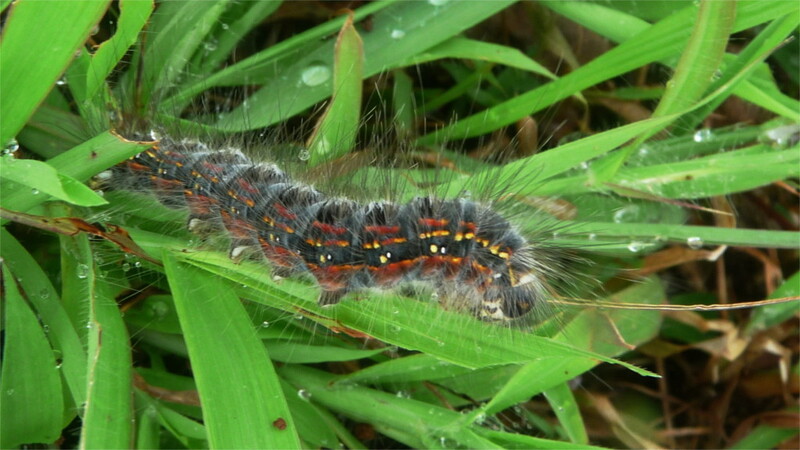 I had evidence for this soon afterwards when we arrived at a grassy meadow full of caterpillars. I don’t know which butterfly they will metamorphose into, but the complete fearlessness with which they crawled across the ground, and the absence of predators, probably means that they are toxic. I’m sure I missed a very large number of insects. It was raining hard, so most of them were probably hidden under leaves. Since it was muddy, I was not intent of kneeling or sitting to peer under the low leaves of the Karvi. So I’ll have to leave the job of talking about more beasts of the plateau to someone else. 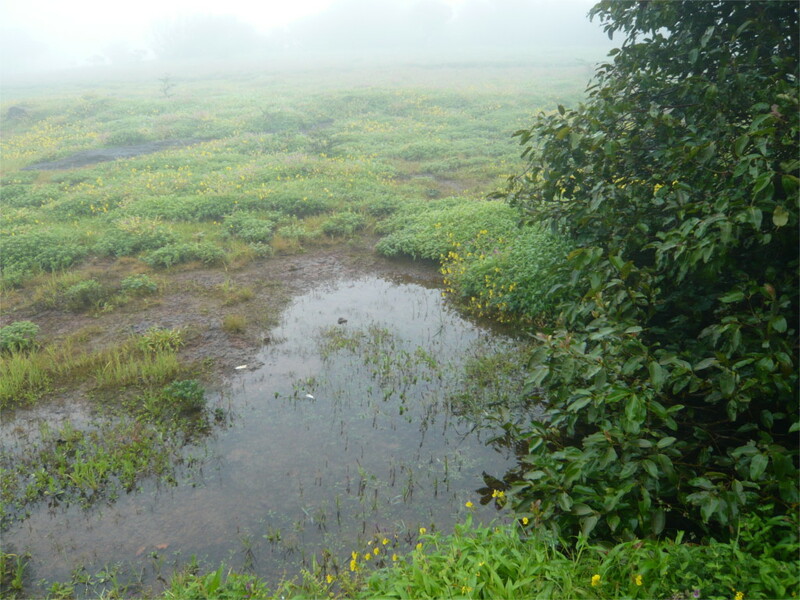 If only all visitors to the Kaas plateau were as subtle as Neruda’s lover, they could come and go among the flowers and the water, and no harm would come to anything. Unfortunately, some are not. In the featured photo you can see, through raindrops which kept falling on my lens, hordes of people trampling bushes in order to take selfies among flowers. This, in spite of guards blowing their whistles and shouting at such deplorable behaviour. At one point I was standing on a path, using a zoom to take a close up of a flower which was about a body length away. 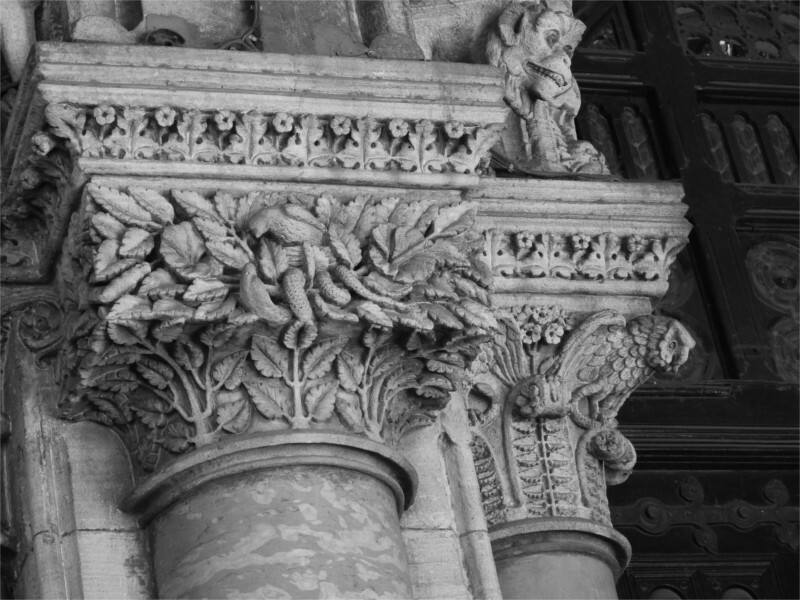 A young woman walked right up to the flower, knelt on the bushes around it and used her mobile phone to take a close up. She left a long trampled swathe of greenery behind her. All this happens on the only protected plateau left in this region! Of course, all visitors are not like that. Most are probably like the couple you see above. They stood next to me as I took a photo of a patch full of the purple flowers of bladderwort. Then they walked away along the path, hand in hand. Now as I look at this photo, I realize something that I missed as I followed them along this path: collectively, our lightest footprints change the ecology. One person’s passage may not cause damage. But a hundred careful couples, fifty conscientious photographers, or two deplorable persons, wear out these paths through the rock and prevent plants from growing where they pass. Other, equally interesting, plateaus nearby are not protected. 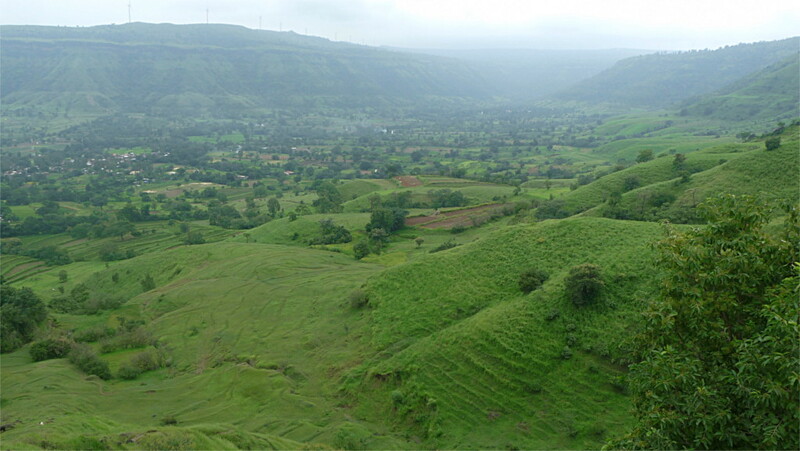 The Chilkewadi plateau, which you can see in the photo above, is full of windmills. Properly planned, these could be an ecologically low-impact alternative to other sources of energy. Unfortunately, they have been placed in one of the last few inselbergs which harbour many rare plants found only in the western ghats, a subset of which are found only near Satara. In the deep fog I’d stepped into a meadow and retreated immediately when I saw that it was full of Topli Karvi and bladderwort. Then I noticed that a work gang was in the same meadow, working on one of the giant windmills placed there. On my next visit to this region I will try hard to argue with my companions that we should spare the Kaas plateau, and instead spend all our time on the Chilkewadi plateau. 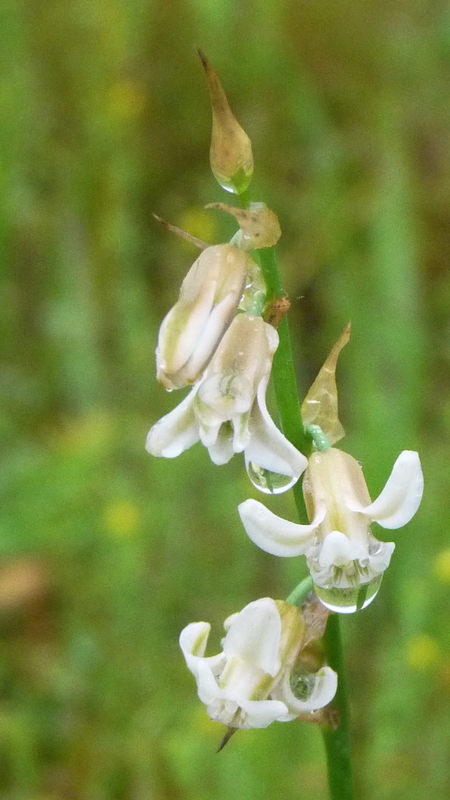 It has the same flowers as Kaas, and by not going there, may be we can help that ecology to repair itself. Can we adopt the slogan: Visit Kaas only once in your lifetime? We can start frequenting nearby plateaus. 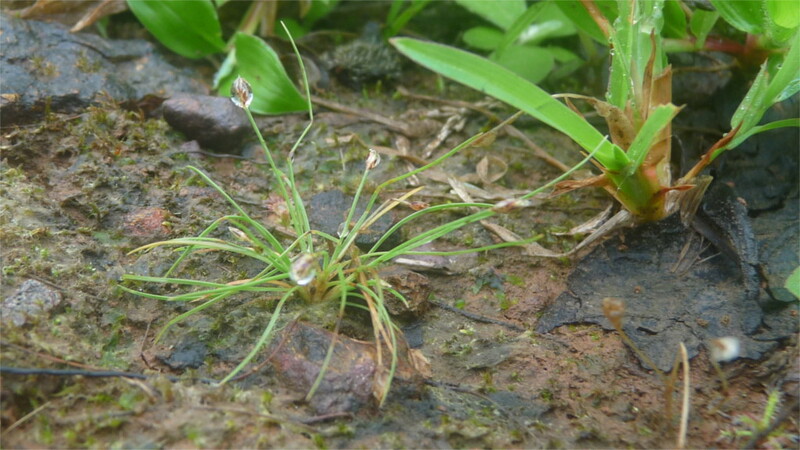 Many of the plants grow in other parts of the Sahyadris as well. I know that I can convince very few people alone. But if you help me out by doing this, and talking and writing about it, refusing to like photos of people standing among the flowers of Kaas, then maybe we can change the fate of the bladderwort, sundew, Karvi, Indian arrowroot, and other such strange and vulnerable species. Maybe you have a different idea. I would love it if you put it in the comments below. It is important to get together and work on preserving Kaas. On the verge of the parking lot just below Kaas plateau I came across a chest high growth of Chinese knotwood, whose flowers are featured above. On reading a bit, I learnt that this kind of branched bush is characteristic of knotwoods (family Polygonaceae). Information on this species is hard to find because its Latin double-barrelled name has changed many times; it is known as Polygonum praetermissum, P. auriculata, P. chinense, Persicaria chinensis among others. I could figure out that the round berries are edible. Interestingly, it turns out that of the sixty known species in this family, most are found in the Tibetan plateau, and have diversified only in the last ten million years. The home ground of P. chinensis seems to lie along the arc of the Himalayas, and continuing down to Thailand, Indonesia and Malayasia. It is an invasive species, and is probably poised to take over the Kaas plateau, just as it is taking over parts of the US. The Indian arrowroot, which I spotted growing cheek-to-jowl with the Topli Karvi, is a much more sedate plant. A member of the Zingiberaceae (ginger) family, its name has recently changed from Hitchenia caulina to Curcuma caulina. 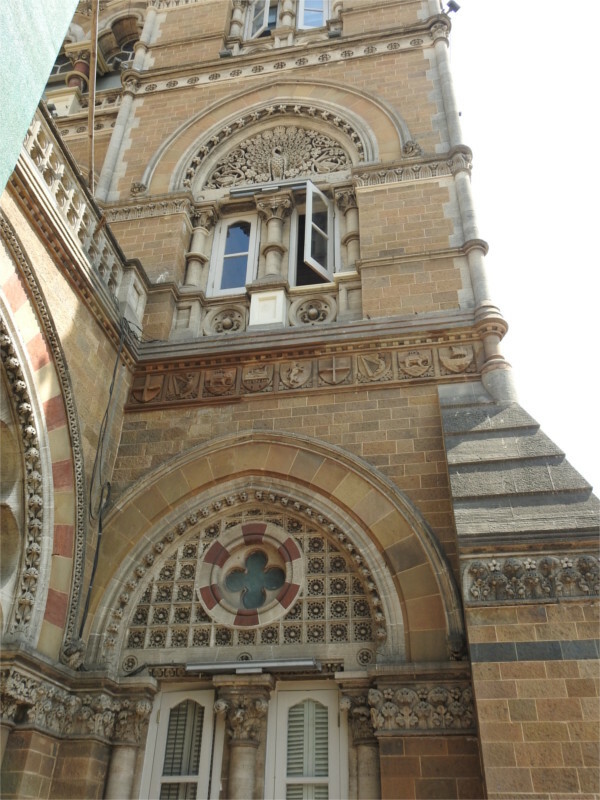 Its Marathi name, chavar, seems to be well documented. Its tubers yield an edible starch. 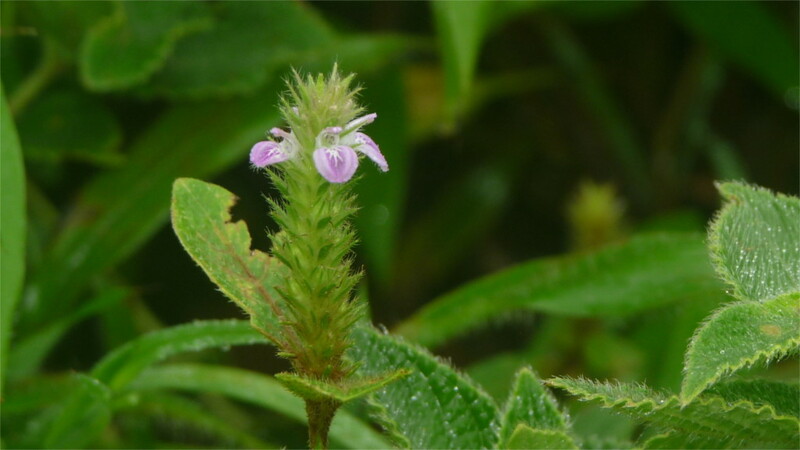 It grows mainly in high plateaus of the Western ghats, like Kaas, so it is vulnerable to a loss of habitat. Since it is economically important as well as endangered, there is an international effort on to cultivate it. 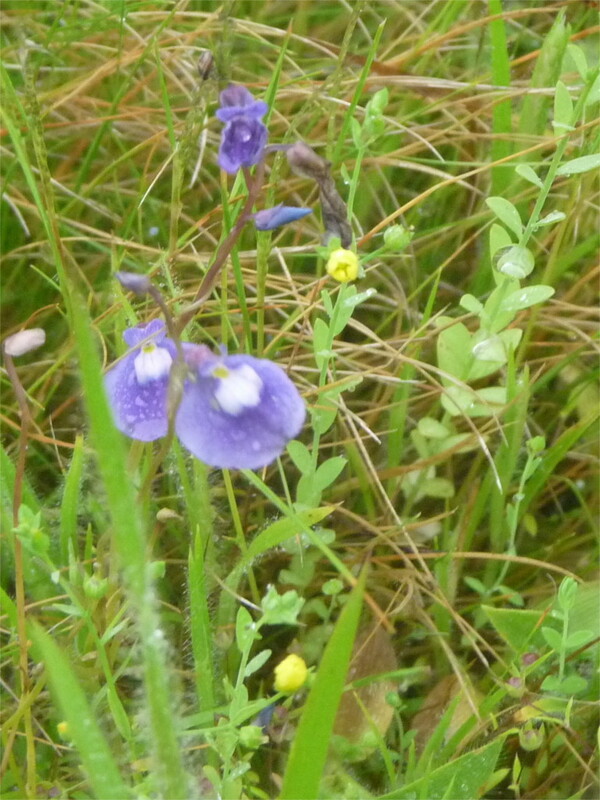 I saw very few of these flowers, and came to the conclusion that it is not very common even in the Kaas plateau. I kept seeing the spikes of the karambal every now and then, with a few small purple-pink petals growing out of the cylinder. I kept postponing a photo, hoping to get one covered with petals. Then when one of my companions told me that this is all I was likely to see, I stopped and took the photo which you can see above. A member of the Acanthaceae family, this ankle-high plant, Justicia procumbens, is given the rather fanciful English common name of water willow. Maybe the name is given because the leaves of the plant, like those of the willow, are ground into a paste used to treat asthma and coughs. 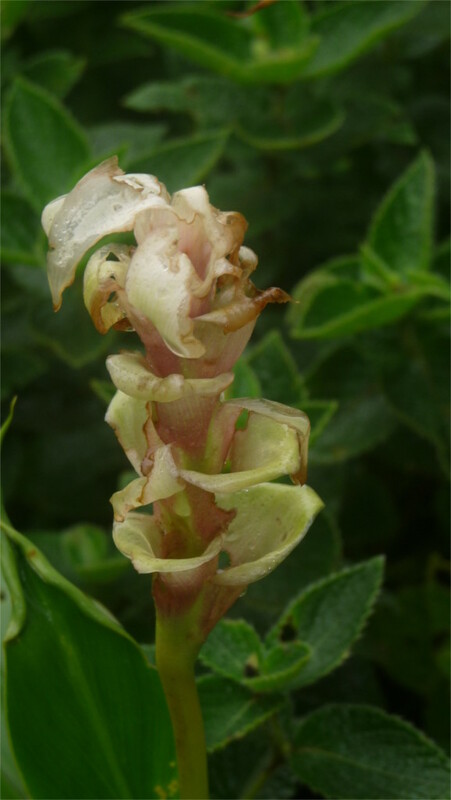 This plant is widely reported in the Deccan plateau, found in Kumaon, known in Japan and Korea and used in Chinese medicine, but is vulnerable to habitat loss. Plants cannot run away from attack; their defensive mechanism is chemistry. Because of this, they have developed a strange armoury of subtle chemicals over their long evolutionary history. That’s the reason why we keep finding in plants new and useful molecular weapons to combat diseases. It will be a pity if the fruits, so to say, of megayears of evolution disappear in the next couple of decades. 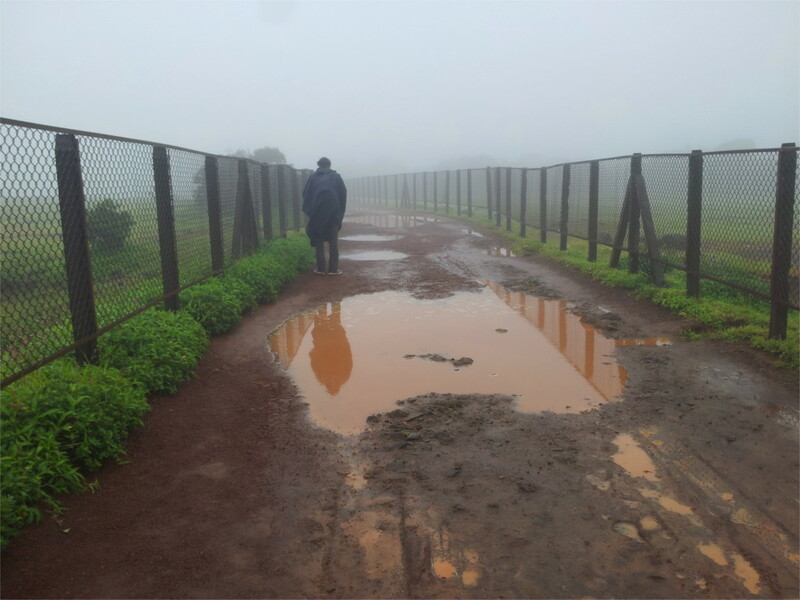 The fence around the Kaas plateau, and the effort of growing plants in the Kew gardens are last-ditch measures. In my reading about the flowers of the Kaas plateau, I’d not remembered the flower which is called abhali in Marathi. But when I started walking through the meadows of Kaas, these beautiful flowers attracted attention instantly. I saw them poking up through fields of Topli Karvi. It seemed to me that they grew in patches where the Karvy was not in bloom, but this impression was heavily biased by the memories of places where I stood and took photos. 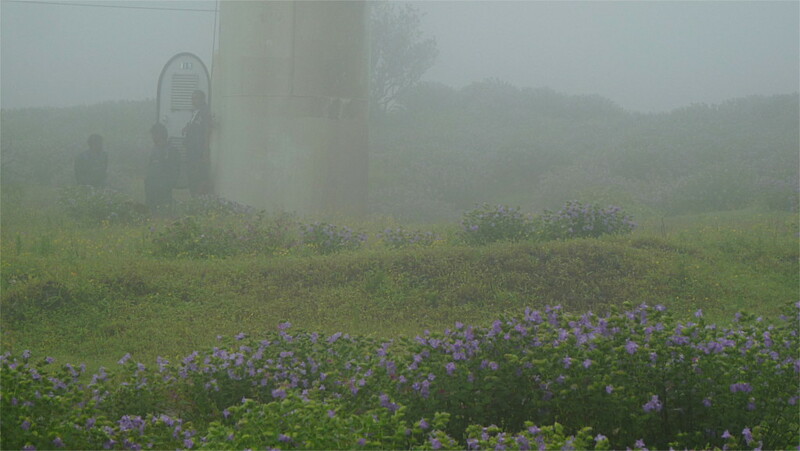 I cross checked it by looking again at the panoramic shots I’d taken of flowering bushes of Topli Karvi, and found that in this case my general impression was probably correct. The abhali blooms where the Topli Karvi does not, but they both like the same kind of soil. The Cyanotis tuberosa seems to have multiple names: it is called abhali in Marathi, valukaikizhangu and netha kina in Tamil, and is referred to by the fanciful names of Cat’s ears or Dew grass. The English names were probably given in colonial times, when its habitat was being systematically destroyed by converting the forests into coffee and tea plantations. The habitat destruction continued with the widespread planting of Eucalyptus, and the building of large dams. Abhali is widespread. Apart from the Kaas plateau, I found it listed as growing in Karnataka, Orissa, Tamil Nadu, and in the eastern Himalayas. So habitat destruction perhaps does not affect this plant as much as many others. 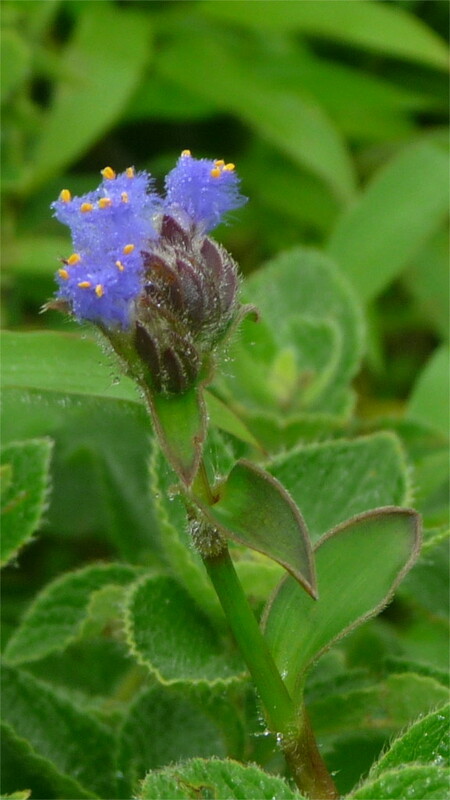 It is the only Cyanotis species complex which has tubers; as a result, it can put out leaves and start to bloom as soon as the monsoon starts. In Kaas it blooms from August to October and around Bangalore it has been reported to bloom in May. The plant is widely listed as human-edible and medicinal, for example, in the encyclopaedic Wildlife and Ground Flora: an interaction scenario of forests of Darjeeling and Jalpaiguri by A. B. Chaudhuri and D. D. Sarkar. At the other end of the country, in Tamil Nadu, the root is ground into a paste and eaten to treat diabetes, and also as a vegetable. In Karnataka it is supposed to relieve coughs. All in all, it seems to be a very familiar plant in many parts of India. I wonder whether it could have spread through India in recent times? 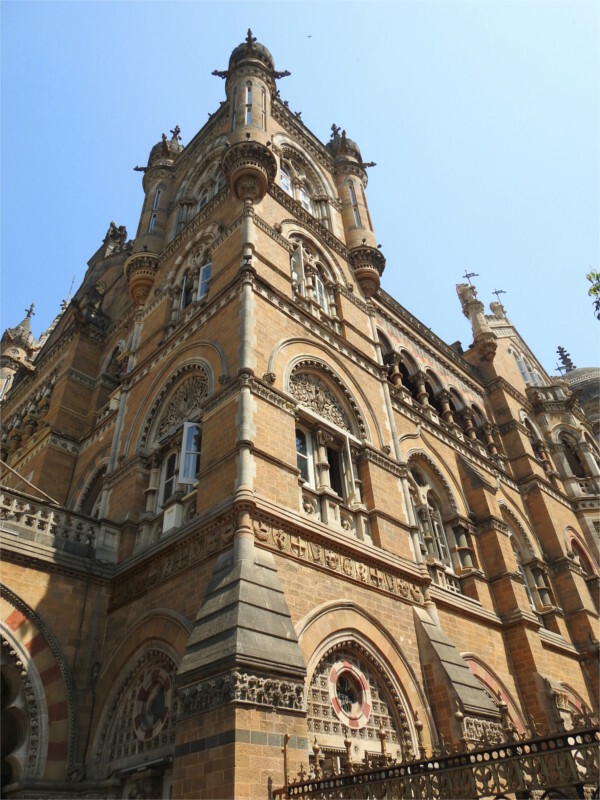 If its origin is in the Deccan plateau, then the fact that it is strongly dependent on the monsoon could have prevented a spread through the dry lands of central and western India. 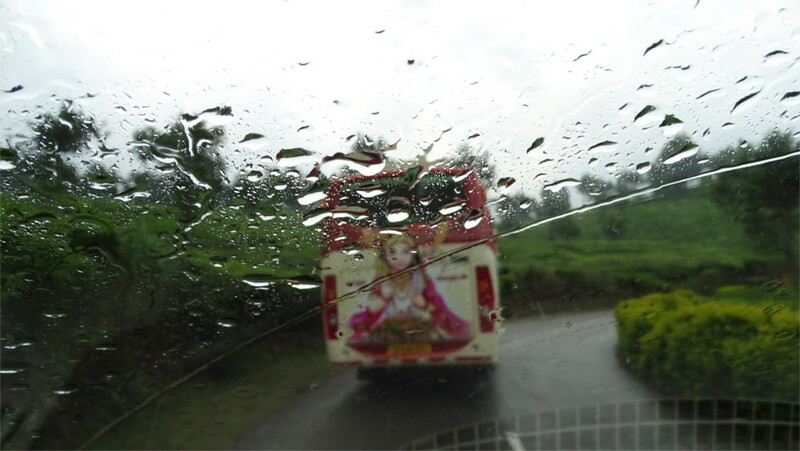 The monsoon opens up corridors along the eastern coast of India, allowing it to spread up through Orissa and Bengal into the eastern Himalayas. I could not find reports of it growing in the western Himalayas. Why? I didn’t know any of this as I knelt on paths and tried to focus on the hairy flower. Now, I wonder why its petals are like hairy filaments which trap beads of water. Does this have a purpose? When I listen to fellow tourists during trips to jungles, it is clear that the stars are the carnivores: tigers, leopards, even wild dogs. In fact I often meet people who do not enjoy the strangeness of tropical jungles, and consider a trip wasted unless they see a tiger close up. So it is also during a visit to the kilometer-high plateau of Kaas: the carnivorous plants of this inselberg enjoy stardom, but are seldom seen or recognized. These stars are the sundew (featured photo) and the small purple flowers of the bladderwort (below right). The bladderworts, such as the Utriculata purpurea whose purple flowers you see in the photo alongside, are the tiger of this jungle. These bladderworts are rootless plants that float on patches of water. I saw them in growing in close conjunction with other small herbs. Since I was a tourist and not a biologist, I did not try to separate them out to check whether they are free floating. 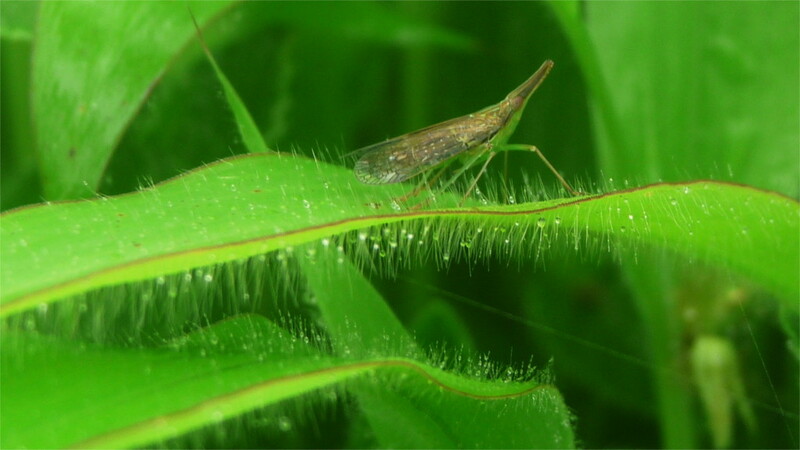 The close association with other plants makes it likely that they float on a mat of vegetation. A recent study found large communities of living algae and rotifers in the bladders of some individuals of this species growing in Florida. So it is possible that Seeta’s tears, as this species is called locally, derives a benefit from supporting an ecosystem within itself, rather than eating everything. To push the analogy further, U. purpurea, may not be the Kumbhakarna it is often thought to be, waking from sleep during the monsoon to eat everything that lands in the bladder. By supporting communities of living creatures, it may be closer in function to Seeta’s mother: the earth itself. Carnivorous plants are usually found in wet and nutrient poor soils. Like many of these plants, the sundew is poor at competing with neighbouring plants for light. We found three of them, probably Drosera Indica, in patches of ground below the roots of Topli Karvi bushes. I often wondered about whether the sundew is beneficial to humans or not, and was pleased to see a positive answer. Apparently Drosera preferentially eat mosquitoes, midges, and biting flies, which would otherwise proliferate in these wetlands, and therefore pose public health hazards. While watching tigers you may also watch birds. While trying to take the featured photo of the sundew, I thought I saw a little tuft of grass growing next to it. When I looked at it again I thought that maybe it was not grass but a lily. I took a photo, and later saw that I was mistaken again. The tiny flowers at the tips of some of the stalks were clearly protected by a single modified leaf. This is called a spathe. Its presence means that the plant belongs to the family Araceae and so is cousin to Irises and Crocuses. I wish I’d looked more carefully at it in the field and tried to take a closer photo of the unfurled spathe and the inflorescence which it protects. Not having made this observation, I have no identification. Please help, if you can. Just in case you like to read about plants, I will leave you to settle down to read this interesting scientific review of the state of our knowledge of carnivorous plants. 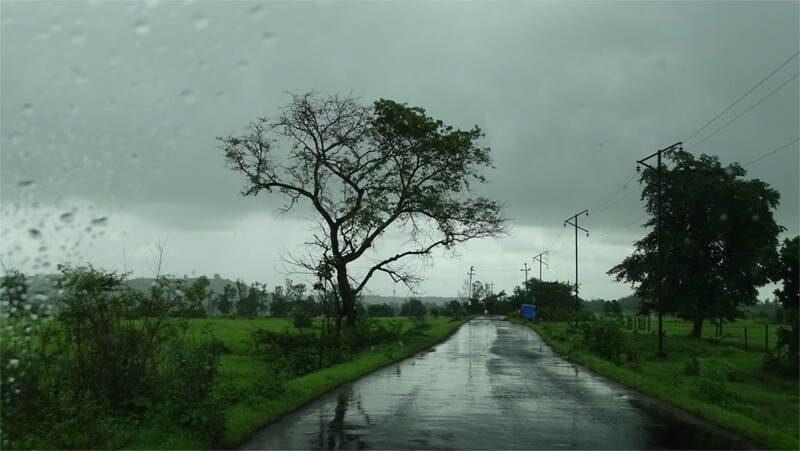 Head out of Mumbai, pass the Expressway and its food courts, and you soon come into impressive weathered hills. Strange shapes rise out of the land. Pass Pune, and head South, and you begin to see ranges of hills with a very characteristic feature: they seem to form gigantic layers or steps. If you look carefully at the far, mist covered, hills in the photo alongside you see these characteristic layers. They are volcanic features called “trappen” in Swedish, meaning steps. Successive volcanic eruptions created these layers. 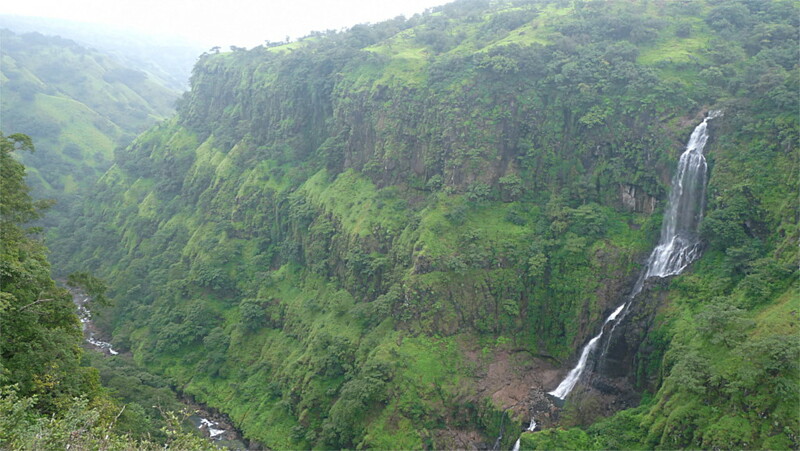 A closer and clearer view of the steps is in this photo taken at the Thosegarh waterfalls south of the town of Satara. These layers are called the Deccan traps. It is thought that thirty thousand years of continuous volcanic eruptions laid down these layers of basalt over a huge part of the Indian plate. This happened while dinosaurs still roamed the earth. 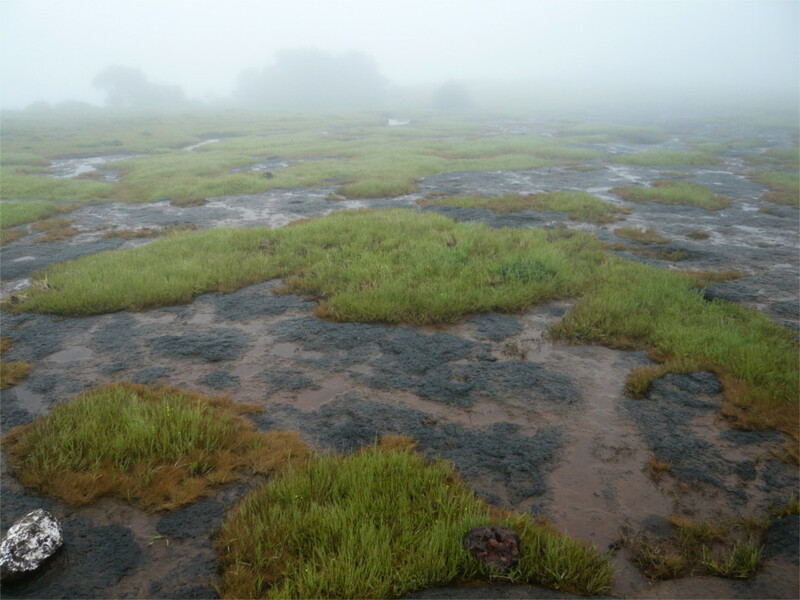 Since then the volcanic rock has worn down to a half million square kilometres area in the Deccan plateau. This is the geology within which the Kaas and neighbouring kilometer-high plateaus stand. Over millennia, the basalt was weathered down by successive dry and wet seasons until it is a porous rock. 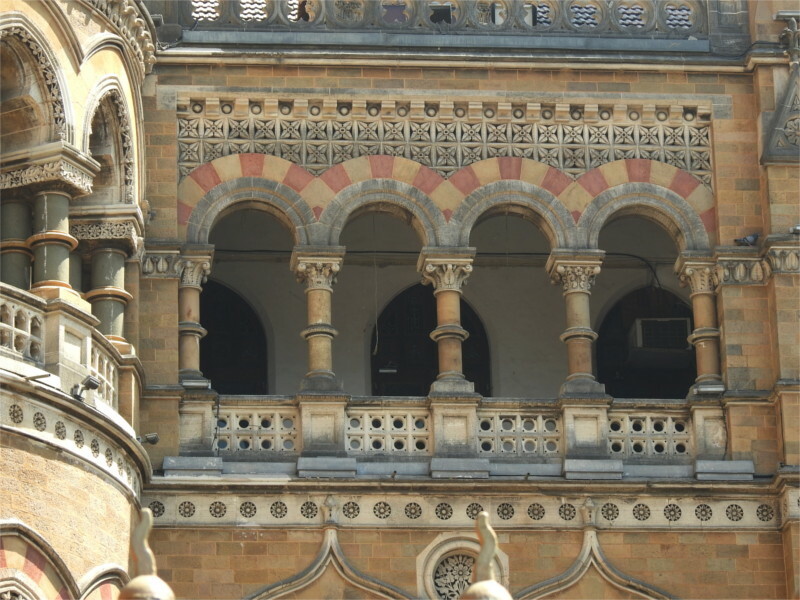 You can see the weathered rock, called laterite, in the featured photo. Over this laterite is a thin layer of red iron-rich soil called lateritic soil. You can see in the photo alongside how poor the soil is. The grasses and the low herbs of these plateaus, including Kaas, barely manage to hold the soil together. Of all the things that damage this fragile ecosystem, tourists are the worst, although the construction of windmill farms and extraction of bauxite also harmful. Reading about this area, I discovered the word "inselberg", meaning island mountain. It is a very apt description of these plateaus: each stands isolated from others. The flora of each of these inselbergs is different from that in the surrounding lowlands. Environmental degradation of a plateau is like killing off the ecology of an island. It seems that of the 850 odd species of herbs identified here (including genera found only here), more than 600 are on the IUCN red list of threatened species. The ministry of the environment lists many benefits that these ecosystems provide, including medicinal plants. Another ecosystem service provided by this fragile system is the recharging of the surrounding water table. As you can see in the photo here, the grasses and herbs trap water into little monsoon pools. This water is then absorbed by the spongy laterite rocks. In the absence of the flora, the water would run off too fast to be soaked up. The average annual rainfall here is between 2 and 2.5 meters, so this is quite a service! I can’t believe that I wrote a piece saying goodbye to the monsoon on Saturday. 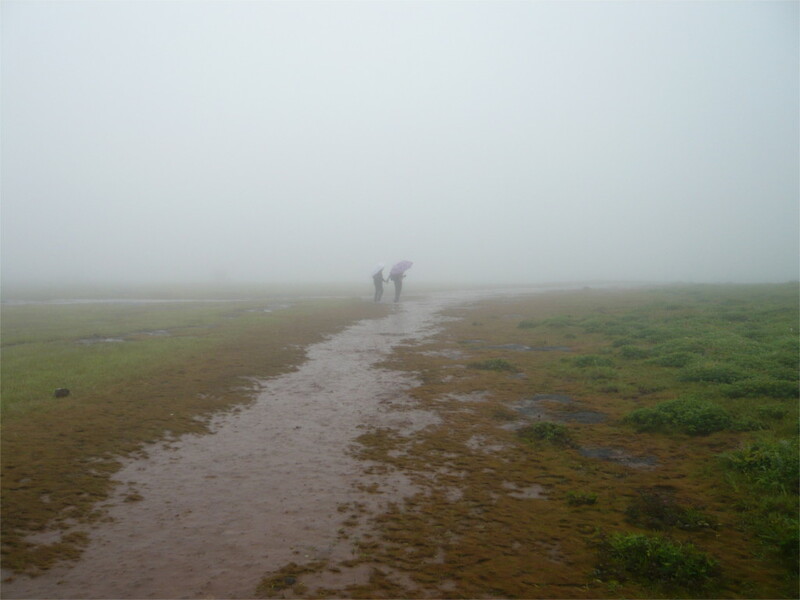 On Sunday I was at the Kaas plateau. It rained all morning. The thin layer of soil was saturated with rain. Then other Sunday visitors turned up, and the soil on the road turned to a well-churned slush. The official website says that 3000 people are allowed each day. It seemed to me that there were many more people there on Sunday. People waiting to get into the fenced-off part of the plateau lost their patience. Someone lost their spectacles. I found the featured image. The press has been full of reports about the Topli Karvi (Strobilanthes sessilis) blooming this year after a gap of eight years. We found fields full of flowering Topli Karvi (see the photo alongside). But then there were large patches of these knee-high bushes which did not have any flowers. The Family had visited the plateau last year and come back with photos of Topli Karvi flowering in some patches. Seeing her photos, I’d speculated that Topli Karvi could bloom once in eight years, but different patches could bloom in different years. Then this would not be a textbook case of mast seeding, such as that seen in the related Strobilanthes Kunthiana (Neelakurinji, which is supposed to flower next in 2018), in which the plants die after flowering. Incomplete synchronization of the flowering of some species of Strobilanthes has been reported from Japan, so this is not a radical idea. It would be nice to see data on this species. I did not see any of the usual pollinators. Perhaps it was raining too hard. The previous evening, near the Thosegarh waterfalls I’d seen Indian honeybees in a stand of the related Strobilanthes callosus (Karvi). Dhamorikar has a very interesting observation about the Karvi: it is pollinated by bees, flies, ants, some moths and maybe even the Oriental White-eye. He speculates that the purple colour of the Karvi has evolved to attract a large number of pollinators. There aren’t that many flowering cycles of Karvi in a lifetime. 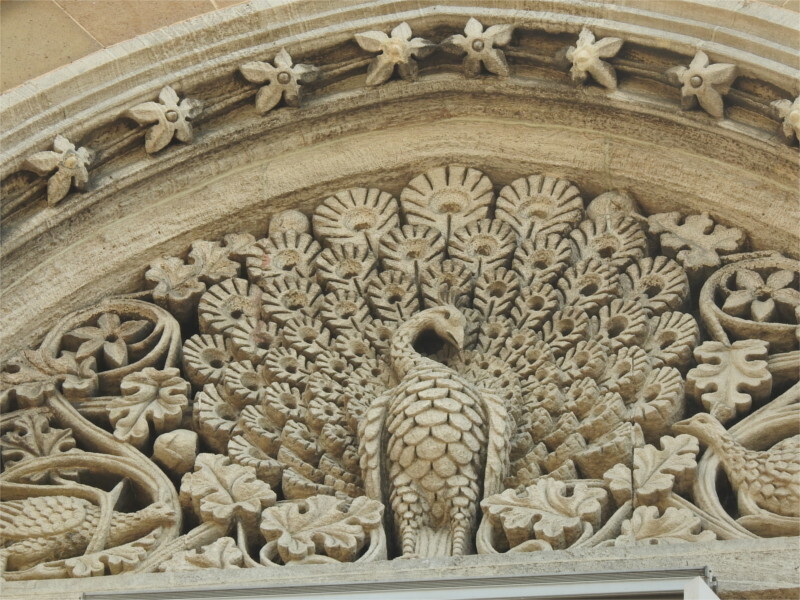 More than one life may be required to solve the mysteries of the blooming of the Karvi.